All stays have a checkout cleaning fee of $140. Stays of more than 10 days have additional mandatory interim cleaning fees of $140. For example, if you had reserved the condo for 14 days, there would be one interim cleaning 1/2 through your stay, as well as the checkout cleaning after you checkout. This condo is close to everything, but also quiet with a drop-dead view of the water and sunsets. This view has it all! Ocean, Sail boats, outrigger practice each afternoon..often with 14 canoes going down the channel to the ocean, city lights and often morning rainbows. Friday evening Hula and Hawaiian Music show viewable from the condo lanai followed by fireworks display from the Hilton Hawaiian Village. Friday night Buffet is available, also. Large lanai has a table and two chairs so you can enjoy dining and relaxing with spectacular views! Laundry room located on every floor of the Ilikai. Coin operated. Detergent can be purchased in the hotel shop. $2.50 per load. Dining table with seating for four on the lanai. Vanity and Shower with tiled walls. Shampoo, conditioner, lotion, soap are provided. No hair dryer. Welcome to your Home away from Home. Come in and Relax! Coin operated. Bring your own coins and detergent. $2.50 per load. The Ilikai Hotel & Condos is located on the north end of Waikiki Beach directly off the Ala Wai Small Boat Harbor overlooking this marina and Magic Island Park and beach. Boats , including large catamarans, tie up to 'visit' just in front of the condos on this side of the Ilikai. Waikiki Beach is a few steps away: just walk down the ramp and you are on the beach. All of this beach is open to the public. Ala Moana Beach Park is a 10 minute walk in the opposite direction. The world famous Ala Moana Shopping Center is a 2 minute bus ride or 5 minute walk with a very large Food Court, high end and not-so-high-end shopping and restaurants and relaxing places to sit and enjoy the atmosphere which includes the unique 'Koi (carp)' River running through it on the second (of three) levels. The Ilikai is also steps away from banks, post office, with 'The Bus' just in front of the Condos going in both directions: to downtown Honolulu (and Chinatown) and in the opposite direction to the Waikiki shops and world famous hotels like the 'Royal Hawaiian' and Moana Hotel. A wonderful November in 1304! This was our first ever extended getaway to a warm climate; previous trips to the sun have been for a mere 7-10 days. We chose Honolulu because we knew that if needed, emergency health care would be reliable and it is an easy, nonstop flight from Vancouver. In a previous visit in February, we checked out many condos near Waikiki and chose the Ilikai because of it's proximity to the water and to shops for groceries, the buildings are well-cared for, as well as the location away from the madness of Waikiki. 1304 has been lovingly well-maintained and the owners obviously care about their suite and the comfort of any guests. We had most meals on the lanai (it was such a lovely place to eat breakfast and supper, why would you go to one of the overpriced Honolulu restaurants?) and found we could prepare simple meals quite readily with the implements and dishes provided in the kitchen. Thank you! For two people, 1304 was perfect. We enjoyed the various entertainment offered by the hotel on Fridays and Sundays, although could have done without the much-hyped 3 minutes of Hilton fireworks on Fridays. The beautiful sunsets are all that you need. Yes, you couldn't avoid the music but it always ended early so was not a disturbance; nor was the loud yoga instructor at the hotel next door a problem! One has to be realistic about what your are likely to experience at a downtown condo that happens to be on the beach. We only had noisy neighbours once for a few short hours.Only complaint was with the way the Ilikai handled a fire alarm one night at 1230 a,m. ; we had to evacuate but were never told what exactly happened, and even after finally getting the "all clear" over the loudspeaker, the alarm continued to go off for about 2 hours telling us to get out. Very confusing! Ilikai needs to get their act together; a fire alarm is a serious issue when there are elderly people and families with small children in the building.One addition to the unit would be a shopping cart on wheels that one could use for grocery shopping. A pineapple is heavy to carry home, along with other groceries, so such a cart would be most desirable. But thank you for the many cloth shopping bags. Groceries are quite pricy in Honolulu, but goes with it's idyllic island location.Thank you to 1304 owners and to Aloha Condos management! Well done! Thank you so much for all you kind words about the condo at the Ilikai Hotel. We are always happy to see that the condo worked well for guests and they are happy with their stay. It is a great location, great views and a great condo. We are sorry that the Hotel had some disturbances with the fire alarms one night of your stay. I am sure that safety of course is first so being causious is always a good thing. We have not herad of this happening before so it is not a normal occurance. As you mention this is a great location but as you realize with a big city atmosphere there will be noise to some degree as with millions of people it cant be avoided. I do believe though the 13th floor location for this condo does help. We enjoyed our time at the Ilikai Hotel Condos. It was an easy walk to Ala Moana shopping centre, and to the main part of Waikiki for dinner. The condo was very clean and well equipped, and had a lovely view out over the water. The condo and location and view were excellent. My only complaint is that all the dishes and silverware were filthy. We had to wash everything before using them.thanks! Thank you for taking the time to post a review for the unit 1304 at the Ilikai Hotel. This condo is located in a great location close to everything and the views are exceptional! The condo is setup for being able to prepare meals which is a great option. We wish you would have let us know about the dishes as we certainly would have sent someone over right away. What might have happened is the previous guests might have done the dishes and put them away and did not properly clean them. The housekeepers of course do any dirty dishes about the kitchen, but do assume that the dishes in the cabinets are clean. We might have to have the housecleaners take some time to look into the cabinets as a whole. This condo has everything you need for a self catered holiday. The bed is super comfortable and the location is ideal if you want the ‘quieter’ end of town, beside the beautiful lagoon and eye catching marina. The beach is an easy 5 min walk and the Ala Moana shopping centre is just 2 blocks away. The bus stop for all attractions is at the front of the hotel. I loved my stay here and would highly recommend it for couples and young families. This apartment is great place to stay. Excellent location, the property is nice and clean, in good condition, has good space and the amenities all work. The property has excellent views of the sunset, and I would definitely stay here again!! Enjoyed the stay.Very clean, modern and spacious condo. Great location. Wonderful views and in the heart of numerous amenities. Highly recommend aloha condos and will stay here again next time we want to leave winter weather here in Alberta. Website and contact very friendly and accomodating.Thankyou Aloha Condos. This was a great stay. The Ilikai is within walking distance to Waikiki beach, but just outside the whole hustle and bustle. Lots of options to eat -- you can walk to the mall for an amazing food court, or just stay right around the hotel. The bed is super comfortable, and we enjoyed sitting on the deck with coffee in the morning and wine in the evenings. The only suggestion I would make is to replace the mats in the bathroom with something absorbent. The kitchen mats in there now would remain wet for quite some time after a shower, which often made for a surprise if you went in there at night. We returned to the same room we had in 2016 and again enjoyed the facilities and particularly the view. In fact, we are planning to spend another night in the same room in early September on our way back to Australia. Thought overall very good just a few things There was no broiler rack in the oven, no potato masherA dishwasher makes a holiday completeSome nice fresh pillows would have been nice also the sheets especially the white ones were just plain awful, and the tea towels were worn and looked dirty as were the oven mits, the toaster could do with replacing.We had 3 and a bit weeks there and it was very comfortable just actioning The above things would make it really comfortable. This was an excellent apartment. The hosts put a lot of thought and friendly aloha into their lovely condo. Clean, furnished nicely, very comfortable bed, great lanai and view of the Ala Wai Yacht Harbor, where I grew up. I would definately stay in this condo again and hope to book it for next hear. Mahalo for your wonderful hospitality and lovely apartment. We enjoyed this condo very much. Great location and clean place. We would definitely stay here again! The unit has been the same over the past few years that we've stayed there. It is like a home away from home for us and we hope when we leave it is as clean as we found it. Because of this we could do with one less cleaning per month. Wonderful stay in 1304. Well maintained unit overlooking my old digs at the marina. Got in some great swims at the magic island lagoon, and enjoyed mostly outstanding weather. In the heat of summer I think an east facing unit might be preferable but in January this one was perfect! It even has louvered screens for a bit of shade when needed and a nice fan to augment the tropical breezes and a super comfy stressless style recliner to take it all in in comfort. One complaint if you could call it that, it would be nice if the wifi code was written in big letters/numbers on a piece of tape on top of the box, maybe with a big arrow pointing to it! We love the vibe of the Ilikai and the surrounding marina. Great view and easy access. We will continue to comeback. Thank you for your review for the unit 1304 at the Ilikai Hotel. We do appreciate your feedback. The condo is very conveniently located and close to everything! We were not aware that the pool had been closed but it seems that there are some renovations going on but the good news is the 2nd pool was open to use during your stay and we hope you took advantage of that. Also the Lagoon is just steps away and is another option for swimming with calm and a bit warmer waters. I wanted to note though that the pool and amenities are only for guests that are staying at the hotel, so therefore your niece and nephew would not have been allowed to the pool. I am not sure if you have ever had to use the parking before but pretty much everwhere you stay in Oahu, there are parking charges. Actually parking around this hotel does have several options that vary in price depending where you park. We do give these options for inquiring guests. The guests at the hotel or the private units all do have the same price for parking. Another option is to use public transportation instead of renting a car, such as the great bus system which can be accessed just steps from the hotel. We hope this information helps if you choose to stay again. The Condo is situated a short walking distance from Waikiki Beach and has a great view of the Marina. Check in an Check out procedures were smooth and easy. The Condo is adequately equipped for a week or longer vacation stay. It has a full kitchen, King Sized Bed and Sleeper Sofa. The only recommendations I have would be to get rid of the carpet and go with tile flooring as it is much easier to keep clean. One of the glass panes on the Lainai door needs to be replaced and was covered with cardboard. 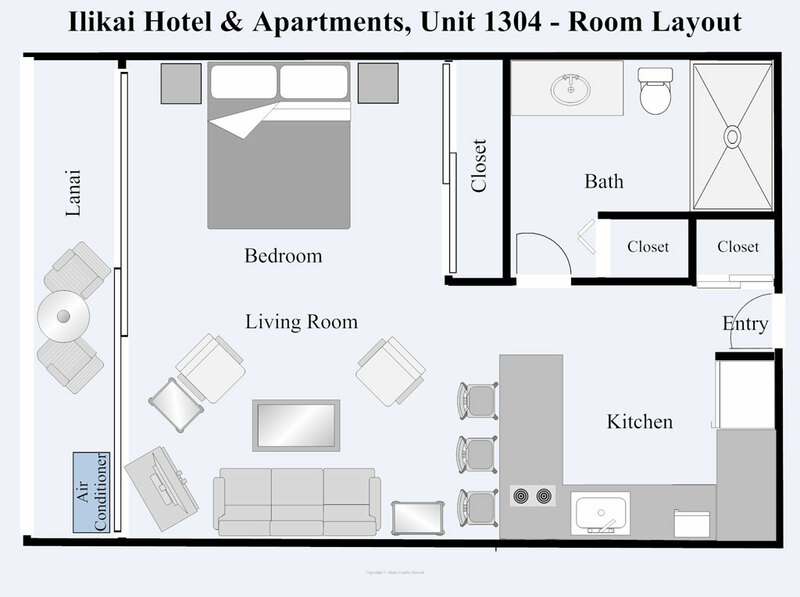 Thank you so much for your review for te unit 1304 at the Ilikai Hotel. The condo is in a great location and convenient to everything. We are glad that you found the processes to go smoothly and you found the unit to have what you needed. Flooring I guess is a matter of preference but the owner will look at your suggestion. The glass unforunately was broken recently by a guest and the replacement process has been timely but it is in the works. Thank you again for your review and we hope you can come again. What a great find! I was a bit nervous about pre paying and the validity of the site but I needn't have worried. The unit was as described and the photos reflected reality. The view was wonderful and the kitchen well furnished. Having an access code entry is great. No waiting at reception when you arrive (and depart) and no swipe cards to worry about. We were two single adults traveling. Both the bed and the sofa bed were really comfortable and having a slider to close off the bedroom was great, it gave us privacy at night but opened up to a large room by day. I'm not sure how comfortable it would be with more than two adults, might get a bit cramped but certainly our stay was wonderful and I am recommending Aloha Condos to all my friends. AlohaWe selected suite 1304, firstly for its views and secondly for its central location – we were not disappointed.The suite is nicely appointed, comfortable bed, clean and well presented. The beach gear in the locker box on the lanai was an added bonus. For any one new to Honolulu, on Friday nights be sure to participate in the fireworks and Hula next door at the Hilton.We will more than likely return to Honolulu and there is no reason why we would not select suite 1304 again. Aloha Condos & Homes provided an awesome service. Their communications was first class and timely. We highly recommend these guys for your next booking. We enjoy 1304 mainly because of the view and the central location. It is kept clean and has been updated. The afternoon can be hot, being in the direct sun, but the fan we bought, and left, took care of that problem. We have been coming to the Ilikai for several years, the last six or seven years in 1304. We look forward to it each year. It's a bit like coming home. Loved suite 1304. Great view, quiet and well appointed. Everything one needs is in kitchen.Read a great book that was in bookshelf to. Would stay again. The accommodations exceeded our expectations. We really loved our stay in the Ilikai Hotel Condo 1304 for our vacation this year. Everything was as described. Kitchen was particularly well equipped including coffee maker, toaster, oven and microwave. Window views of the marina and ocean were great. King sized bed was very comfortable, and we had a choice of pillows. For early arrival before 3 pm, leave your bags with the hotel baggage storage on the main floor. Hotel pool is warm, free towels supplied, and a great place with kids, also. Corner air conditioner tended to make that corner too cold and bed area warm. Fan helped the circulation of air. Wow, you really covered 'the waterfront' in your review..thanks for it and glad you enjoyed the Waikiki scene from 1304 Ilikai. We enjoyed the views from the lanai with the boats, the rainbows and amazing sunsets. Also the pool and the proximity to activities. We would like to do it again next August. TWe really enjoyed our stay. The condo had a great view, was well equipped interior-wise but newer a hair dryer, had a comfortable bed, was centrally located to everything & had a lovely swimming pool. Even though the ala moana centre is close for shopping, make sure you visit a Ross store &/or the waikele outlet stores. Great rental car location across the road - keep yr eye out for really good deals before you leave home - Alamo a good start. Thanks for the review! The view is exceptional and we do try to have all your needs met in equipping the condo. You could not be in a better location with the central location. Thanks and please come again! We love this condo but were disappointed this visit in the limited supplies. No toilet paper beyond the initial roll...likewise with paper towels. Not even pepper in the kitchen...salt only. These items are not required, but since the ABC store across the street doesn't stock paper products, obtaining more was a pain. Seems to me an extra roll of t.p. would be nice. Maybe a single box of Kleenex, too. Your review is appreciated. There should have been toilet paper for a week and the manager is apprised of the glitch. We are looking at other non-perishable items being supplied. The store on the first floor of the Ilikai is well stocked. Thanks for your comment. We really enjoy #1304, having stayed there over the past 5 years. It's well kept, updated, and feels like home to us. We also appreciate the consideration re our dollar and the rent charged. Thank you for being return guest and it is such a complement to know you feel this unit is home to you. We do our best to keep the unit in get shape, clean and accommodating. We hope you can continue to stay with us! 1304 came as advertised. We personally are used to and appreciated a King Bed.As stated in many reviews, the view is awesome. Watching the endless stream of fishing and sail charters coming and going was a great diversion.1304 is situated in the complex such that the sun doesn't hit the lanai until mid afternoon, keeping things cool until then... then staying until the 6 awesome sunsets we experienced. Well appointed condo with beach chairs, rolly bag for beach and shopping, which we took advantage of on several occasions.Kitchen was super...only suggestion is to add a blender.The only reason we couldn't give a five star rating was the construction noise that disturbed the ambiance during the day...obviously not the fault of aloha condos or the owners.. Thank for your review. We welcome feedback so that we can ensure a great experience for our guests. We try really hard to describe our units so that our guests know exactly what they have booked. The condo is well equipped with all one might need and the location and views make it extra special. The owner is taking your suggestion about getting a blender for the unit and it will be available soon. Unfortunately we cannot stop progress and especially in a busy city. There will be construction from time to time that is out of our control. However, we do our best to give notice whenever we are informed. My husband and I enjoyed our 10 day stay at the condo. The view from the lanai was breathtaking with rainbows and beautiful sunsets! The kitchen was well-stocked, the king sized bed comfy, adequate water pressure from the shower but no tub, lots of storage, good wifi, working AC and much needed fan was available. The complaints are minor: seating (sofa, bar stools, leather recliner was just okay) was uncomfortable (condo should hold 4 people but in my opinion is adequate for 2) Email sent ahead of the trip (asking about parking) was never answered and too many copies of rules, rules on the door, in every email, and even one about taking off your shoes... rules, rules, rules... Did not give me the feeling of aloha. Nothing personal from the owner made the condo feel more business than being invited to someone's home but again, that's minor. We were visiting Hawaii, not the owner of Condo #1304. We would recommend The Ilikai Hotel and Condos to family and friends. We are glad to hear you enjoyed your stay at the Ilikai Hotel unit 1304 and you would recommend it to others. The views are spectacular and the sunsets are a bonus! The condo does sleep 4. We like to have the option because often people are looking to save money and do not mind having the sleeping options in one area. We do disclose the rules from the owner as well as the complex as it is necessary like anywhere you go. We let everyone know in the emails sent out as well as posted in the condos to make sure they are read. We do have to protect ourselves and our owners from guests who do not want to comply with the rules or say they did not know about them. Regarding the shoes off in the condo, this is part of the island living. It is done out of respect and tradition as it is part of everyday life there. Completely satisfied and beyond expectations. Would be 5 stars but there ARE superbly plush sites in Hawaii if coin no object. This was the best check-in procedure and hotel room access we can recall, without the tour bus mobs that inflict even the most pricey competition. The room site and furnishings were handsome and delightful, and the owners had been truly thoughtful in providing for all reasonable contingencies. We felt that we had been invited to a friend's vacation digs. The ocean and Honolulu shore views across the yacht harbor from the broad sliders and balcony were grand. We have always enjoyed the Ilikai site (from 1966), and consider the access to Waikiki, Ala Moana and proper restaurants just fine. It was too (and unusually) hot for late August, with even the natives wilting, but the 1304 site did well (the sliding terrace shutters an appreciated plus. We do hope to inhabit 1304 again in the future, and will specifically request it. We've stayed in this condo a couple of times and have enjoyed it both times. It's technically. One bedroom, but with sliding screen doors opens up to be a large studio when there are just the two of us. The kitchen is complete and open to the living room. Condiments and such are minimal so plan to pick up your own spices, etc. we love looking out over the yacht harbor from every room! The sofa can sleep more people if you have kiddoes with you. Nice but not pretentious. Casual comfort. We start with this one every time we search. The booking and entry process went great (door code access very helpful). The condo had a lovely view of the ocean and the marina with a roomy enough lanai. Everything you need is there with a well stocked kitchen and good choice of tv channels and reliable internet.Lots of personal touches in the condo and comfortable bed. As we were there during a very hot and humid stretch in August we found the window A/C unit could not quite keep up but the stand up fan provided circulated air quite effectively.We did not discover the restaurant in the hotel (cinnamon's?) until the end of our stay which is unfortunate as we would have had more meals and drinks there. Also the spa in the hotel offers a 30% discount to guests and I had a wonderful massage there. The room is perfect for us because we have older people and a little kid, and it has a divider to seperate the place. The condo's location is excellent. It is close to beach. Most importanly, it has a nice view out the balcony and it is quiet. It was enjoyable for us to stay at your Ilikai Condo, room number 1304. The scenery from the room was beautiful, especially at sunset. We usually stayed at western part of Oahu, such as Ko’Olina, Makaha or Turtle Bay for three weeks or so when we were in Oahu. We parked our car at Ilikai Marina. The fee, $20.00/day was expensive.Various tools you provided for us on the lanai were very helpful, when we went swimming to Kailua beach. But the chairs in your room were not properly paired. We did not feel at ease, when four of us had a meal all together around the counter.And dish washing machine is desirable. We are so glad you enjoyed your stay in Ilikai Condo 1304. Certainly as you know it is very convenient to the excitement and activities Waikiki has to offer, but at the same time it is quiet. The beach chairs, toys for children, snorkeling equipment is all there for visitors to use, as you found. We do not recommend having a car in the area for two reasons..the first being that it is always expensive to park in a city so close to its great attractions and secondly car rentals, three of them, are right across the street in the Discovery Bay building: National, Avis, and Enterprise..as well as Advantage in the Ilikai lobby. While we stay at the Ilikai we rent a car when we want it..otherwise several buses run literally just to the front of the building. The bathroom was completely renovated in May of this year. We always eat on the lanai where there are four chairs..it is so gorgeous and pleasant…the bar area only comfortable seats three.. as you see in the pictures of the condo. Sorry you missed your dishwasher..something to look forward to when you return home. Reading the description of the condo and looking at the comprehensive photos of 1304 would have shown you that there is no dishwasher. Nice place we loved the room. was the first condo/hotel on Waikiki with a real vision behind it that gives you the feel of Hawaii, with a contemporary look and comfort. The bathroom has been completely updated but you know you are inthe islands when you are in this unit. The condo has plenty of storage space and offers supplies for the beach: chairs, towels, small umbrella, float board, snorkeling items. Brian...come again: there is now a totally 'new' bathroom, totally! You'll love it and you will 'know' you are in Hawaii when you use it. All the furniture is less than 2 years old...and new paint...so it looks 'fresh' and at the same time has an Hawaiian feel. very nice stay. condo well represented by photos. older building but quiet and clean. AC worked well and nice view of marina. walking distance to beach and restaurants and shops nearby. condo is not huge, a bit small for large family, but still much bigger than standard hotel room. just if you are expecting a huge condo, it is not. I attended a convention at the Hawaii convention center and it was a 10-15 min walk. very convenient experience were you do not need to check in to hotel, just walk up to your room and use the key pad and walk in. not any complaints at all. maybe lighting in bathroom is a bit dim and also the free wifi worked, but was really slow-- but that was about it. very pleasant stay and good value. View & location are awesome! We located this unit on the aloha Condo web site. The booking & check-in/check-out process was one of the smoothest that we have ever had. The unit was exactly as was depicted with the pictures & details. The view was awesome. We love watching boats & planes, so spent many hours on the lanai or opened the curtains wide and had the same view from nearly anywhere in the unit. Yes you could hear the planes/boats but to us that just added to the charm. Hotel has everything you need. Short walk to bars/restaurants/shopping/etc & all of our tours picked up in front of the hotel. The smoked detector started beeping on the first day, so a quick email & prompt reply had someone replacing the battery that same day. As stated in one of the reviews, the bathroom is a little dark. I just put my make-up on in the kitchen or on the lanai. This issue could be easily fixed with a quick change of the bathroom light fixture. We would definitely book this unit again. Excellent service from Condo Management.Pictures do not protray up-dating needed. Condo was satisfactory for the months stay however the bed requires replacing and furniture rearranged away from air-conditioning unit. The owners provided beach supplies as well as information on shopping, transportation and restaurants that was appreciated. The condo has every thing needed for an enjoyable stay. The bed is 3 years old..but your opinion is important to us and we shall replace it soon. Thanks for your opinion. We had a wonderful 9 days staying in Condo 1304. Great views and sunsets each night, positioned close enough to the Waikiki madness and yet far enough away to relax.The unit was very clean, comfortable and had everything we wanted in a room. We definitely will return in the future. We had a very nice time and enjoyed the room- mostly the beautiful sunsets. The only thing I personally disliked was the lack of lighting in the bathroom. It was hard to see to put on makeup, etc. Please improve the lighting or put a mirror, or mirror wardrobe doors. There was a small area above the closet that looked damaged and some damaged floor tile. I was a bit worried someone would think I did that so I took photos of the damage, just in case. Of course the whole unit could use remodeling or updating, but it was certainly livable. Really wish there was a workout room available, nearby. We were in town for a soccer tournament for 10 days with my family of four. There are two adults, a very tall teen and a tween. The condo was just the right size for what we needed. It had everything we needed as well. The kitchen was stocked so we could cook, there were containers and wrap for the food (which is nice and saved us a huge expense). The only thing that I have to comment on is the bed is listed as a King and it is clearly not. We have a King size bed at home because my hubby is 6'5" and he hung off of the bed in this condo. The bed was comfy though and we still had great night sleep. The condo is at the end of the Waikiki beaches which was nice because it wasn't right in the heart of things...but yet walking distance to everything. Mahalo for your review and thank you for pointing out the incorrect information on the website regarding the size of the bed. Indeed it is a queen size bed and the information is now correct on the website. I am so happy that you enjoyed everything else and had a great time at my condo. Small but very comfortable for a couple. Very beautiful ocean view. At one time our parents lived on the 19th floor with an ocean view and we always remember how spectacular the view was - we had the opportunity to revisit those memories by staying in condo 1304. Good to hear a 'bit of history' with the Ilikai,thanks so much. Did you visit the Halakulani's "House with out a Key?" Clean and relaxing with good ocean view. Condo was clean, nice with all the amenities. Ocean side view was spectacular. Location was good, easy walk to a nice beach, great restaurants and shopping. Easy access to public transportation (Trolley) Over all experience was very good. Only negative was when booked, was told condo had a king bed, but in reality was only a queen. Very nice place to stay, can see staying here longer than a few days. Well organized and pleasing. Great condo. Great location very clean. Everything was perfect. Everything was as promised. Easy access. Great location. I would stay again. This was out fourth vacation at the Ilikai Hotel and the third through aloha Condos. This was our first time in Unit 1304. The kitchen is well supplied. The bedding is very comfortable. The view over the harbour provides wonderful sunsets. However, we did find that we prefer the lagoon view. The unit was very clean and ready on time. This condo just felt right from the minute we walked in for our six night stay.Fabulous views with so much to watch going on, it was hard to tear ourselves away from the amazing sunsets.Location suited us as we found the beach at this end of Waikiki much less crowded.The condo was clean with great storage and kitchen equipment.But it was the little touches that made it home from home - books, CDs, beach gear.We would definitely book this condo again if we come back to lovely Hawaii! They're not kidding when they say Hawaii is a "Paradise". From beginning to end, every need was met. We were glad we had a harbor view. That is why we picked Unit 1304. Everything we needed was in the condo. The only "problem", for lack of a better word, was that at first we thought the only place to purchase food was an aBC store, where milk is $10 a gallon; however, we found Food Land after a couple of days, which was much more affordable. We didn't eat at the condo that much, but we preferred to spend our $$$ on activities instead of food from a "minit market". The staff was very attentive. We had a five-hour gap from check out until our plane left, and the bellmen were more than glad to store our luggage for a nominal fee so that we could make one last spin to the shops and to eat before we headed to the airport. He even scheduled ourshuttle to the airport. Bring lots of "tip" money. The Ilikai is perfectly located if you like to walk, which we did. We could be in the hub of things in five minutes. Our unit was clean and nicely decorated. It was very quiet, too, but the best part is the million dollar view. It's not the fanciest hotel/condo, but all services that are offered at the high end hotels were offered to us at the Ilikai. Glad to hear of your happy experience in 1304 Ilikai, Waikiki. Our stay was very pleasant. We had a good view of the ocean and within walking distance to the beach. Having a kitchen is definitely a plus since our daughter tend to get hungry late at night. Parking is expensive! $25.00 per night at the hotel. I stayed at this condo in November and was in town for business and a medical treatment, but also wanted to have some nice time out. I got it all. The condo is very well laid out and decorated. The kitchen does not miss a thing and it was very easy to get groceries and take out the trash etc.I was surprised to see someone had taken care of little things which are not important but make a big difference, such as serving trays, corkscrew, plastic containers etc.The TV was very easy to use ( I am a bit technically challenged and do not like complicated remotes etc). The condo has very nice furniture, the internet worked all the time, it was quiet and of course has an awesome view. I really liked the booking process as well. Everything went without a hitch, my e mails were answered immediately and check in was non existent, just go up and open the door!I am planning a return trip for next year. we stayed at the Ilikai in 1994 for 2 months and wanted to go back because it was a wonderful experience. The hotel is still fantastic, wonderful view of the harbor and the ocean, great sunsets from the lanai. Perfect location for condo, and a very quiet floor, unit is pretty sound proof, can not hear other tenants through the walls or ceiling. Supplies are plentiful in the unit, coffee filters, laundry detergent, linens, beach towels, beach chairs and a great little kitchen with whatever cooking utensils and appliances you may need. No need to bring your hairdryer, their's is just fine. Also a bill changer by front desk for washer and dryer located a few units from 1304. See the concierge early in your stay,to book activities so you will not be disappointed. Have breakfast at the Wailana coffee shop, pancakes are terrific with coconut syrup-did Ihop once and back to Wailana. Also Shorebird in the Outrigger is great for breakfast as they look right over the beach and have a great breakfast buffet, check for the coupons in "This week Oahu".This unit is best enjoyed with 1 couple, it would be quite crowded with more than 2 people. There is a sofa bed, but very close quarters concerning privacy issues if more than 2 people. On the lanai there are aluminum sliding sun shades, use them in the afternoon to shade the lanai, works great in the cooling of the lanai. The hotel bar and grill is good to. Short walk to the mall, easy walk to Waikiki hotels and shopping. Hilton Lagoon area has a great beach with a great view of Diamond Head. Find a tour to the north Shore, much to see there and check out the Byodo-in Temple, it is a scale replica of a 900 y/o temple in Japan. If snorkeling, try Ocean Joy Cruises, great catamaran and if you don't see dolphins (guaranteed) you can go for another cruise-book early in your stay, so you will have opportunity to go again,(free) sometimes the dolphins are sleeping! View Hilton fireworks on Friday evening from Ilikai courtyard. We recently stayed at the Ilikai Condo Unit 1304 What a great choice. The view from the Lanai was spectacular. We saw it all...surfers, joggers, boats...sunsets and the ceremonial conch blowing for the torch lighting every evening. The condo was clean and spacious and it's obvious that the owners take great pride in the care, decor, supplies and up-keep of their condo. The transportation available right outside was great with trolley, bus and cab service always available. The hotel was great...the pool, the store,the grill restaurant...loved this unit and will stay here again. Diamond Head background photo opportunity around the corner on the beach and home of Hawaii 5-0 opening film shot --Loved it all and was blessed to have our young adult kids come and enjoy this memory of a lifetime before going back to college and starting a new job. Thank you Kat for your assistance in lining this all up for us. Mahalo and looking forward to another stay in unit 1304 next year. thank you for sending this great review of our condo rental in Waikiki..
Condo # 1304 is awesome. Check in was a breeze. It was nice not worrying about "who has the condo key ". The location, value & ammentities are an a+. The owners have thought of everthing ~ We enjoyed coffee on the lanai that overlooks the marina & ocean. Food extras were right across the street ( ABC store & McDonald's ). Great sandwich & wrap bistro also close. It was ideal ~ thank you for making our 10th anniversary very special !! Very comfortable, pleasant and accomodating. Everything was like advertised. We enjoyed the unit as well as the facilities. Would use again. very relaxing and awe inspiring view! This condo inspires a vision of Paradise..truly. We have been coming to the islands for years: this condo has it all. Peace, view, comfort, convenience to restaurants, shopping, beach, pool, excitement and quiet: all in one spot. Highly recommend, you will not be disappointed. Condo 1304 was nicely furnished but lacked a small table inside for eating. The condo could use a bathroom vent and one over the stove. Room was light and airy and had a great view of the harbor. We would stay here again. The condo was clean and the view was out of this world. It was close to everything you would need. very comfortable, comfy bed. great location, would stay again. thank you very much! The unit was reallywell furnished;the chairs sofa and bed very comfortable and must be quite new. As well, there were some touches such as a beautiful writing desk, and book case, which added a lovely intimate feeling with the owners. Of course the view is outstanding of the marina,Ala Moana Park and beach, and we enjoyed the sunsets every evening. The kitchen is equipped with a microwave/convection oven, toaster, coffee-maker and stove top, plus all the dishes, utensils, and pots you would ever need to put out a meal.The bathroom is in great shape, and we enjoyed the shower,being very spacious. The owners have not stinted on making this a very comfortable unit. We were able to keep in touch thanks to the internet service. We would definitely want to stay at 1304 again. Thoroughly enjoyed our honeymoon stay at the Ilikai condo! My wife and I stayed here for 4 nights and thought it suited our needs perfectly. It had a nice condo-like feel with a good view on the 13th floor of the marina and beautiful sunsets, although no beach view really. It was clean and very well furnished with all the amenities we needed. The location was great for exploring Waikiki which we drove to a few times and also walked to a few times since it didn't take too long. Could walk to a good beach directly via hotel beach access, but we ended up using some of the other beaches anyway. Minor issue I had was parking which is not included, I would recommend parking at the marina which was something like $15 every 24 hrs. I would say if you want an affordable stay near the main strip of Waikiki, then I recommend this place!